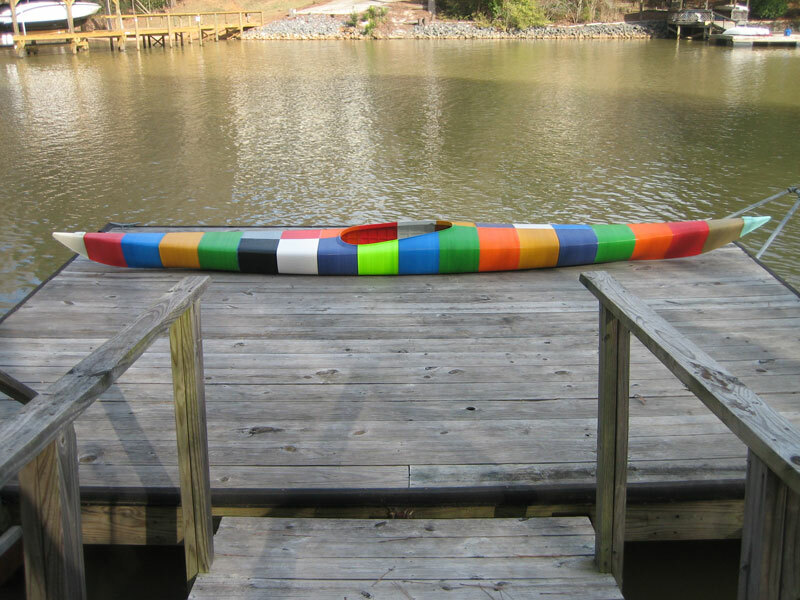 I have completed construction of a completely 3D printed, customized Kayak. 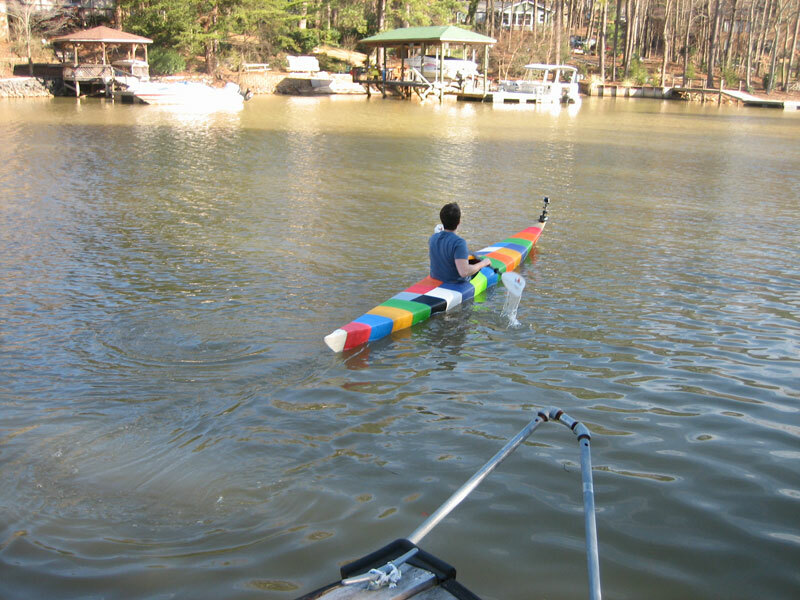 The Kayak measures 16ft 8in [5.08m] long and cost around $500 to make. It is made of ABS plastic, machine screws, brass threaded inserts and a little bit of silicone caulk. That’s it. And it floats. And I can Kayak around in it. In order to print such large, solid sections of Kayak, I had to modify my home-built, large scale 3D printer to print the parts inside a heated chamber so they would not warp or crack. 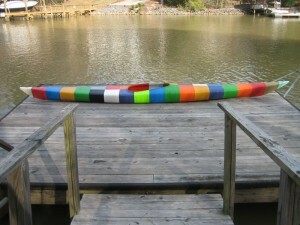 The Kayak is comprised of 28, 3D printed sections. Each section has brass threaded thermoplastic inserts so the next corresponding section can be screwed into it. Silicone caulk is only used between the sections to ensure it is watertight. This design was initially based on the Siskiwit Bay kayak by Bryan Hansel, but heavily modified for 3D printing. The shape of the kayak was tweaked to optimize performance based on my height and weight. 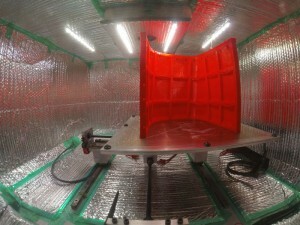 To reduce print time and material usage, the kayak is printed at a 0.65mm layer height. It features a 6mm thick hull with a built-in, internal rib/support structure to give it strength, yet be lightweight and use less ABS plastic. On the bow and stern of the Kayak I added attach points for cameras, handles and future add-ons. Hi, how big was the biggest piece you printed, section 15, how many grams approx in eight? 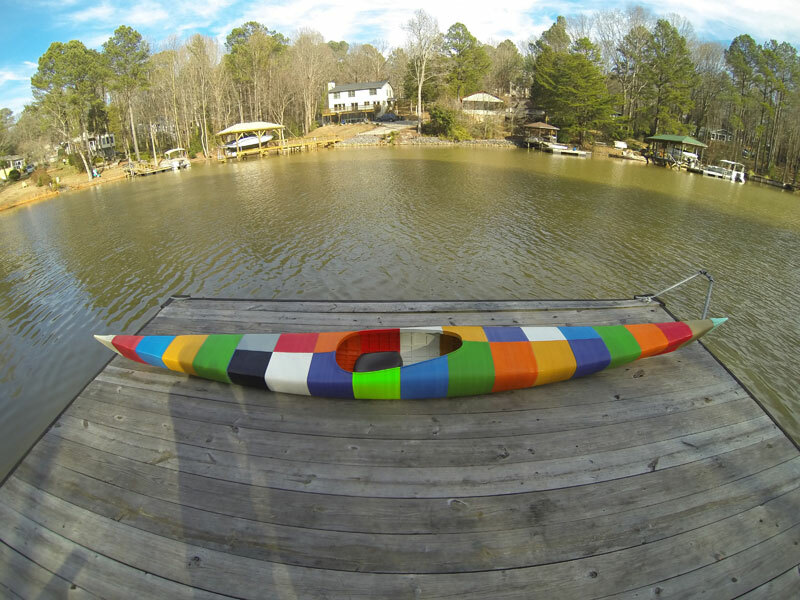 Pingback: 3D Printers Can Only Make Trinkets — What About Kayaks? Very impressive. I was wondering – did you have to do any sealing of the parts? I know that most 3D printers produce parts that are a tiny bit porous due to small gaps in the layers, even at solid infill. Containers I’ve run off on my PrintrBot Simple are not airtight. Thanks! Pingback: SikBitz! 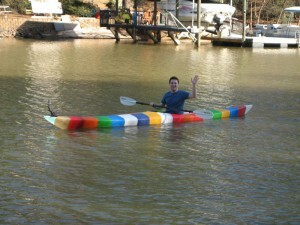 » Blog Archive » Worlds first 3D printed kayak! I am intrigued by the possibility of printing ribs or fuselage frames for SOF kayak construction, 65lbs doesn’t sound llight if you’ve made a skin-on-frame kayak. 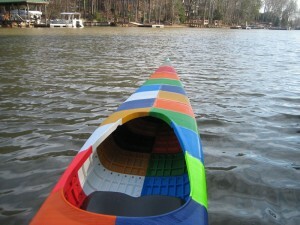 Did you end up printing parts for a SOF kayak? 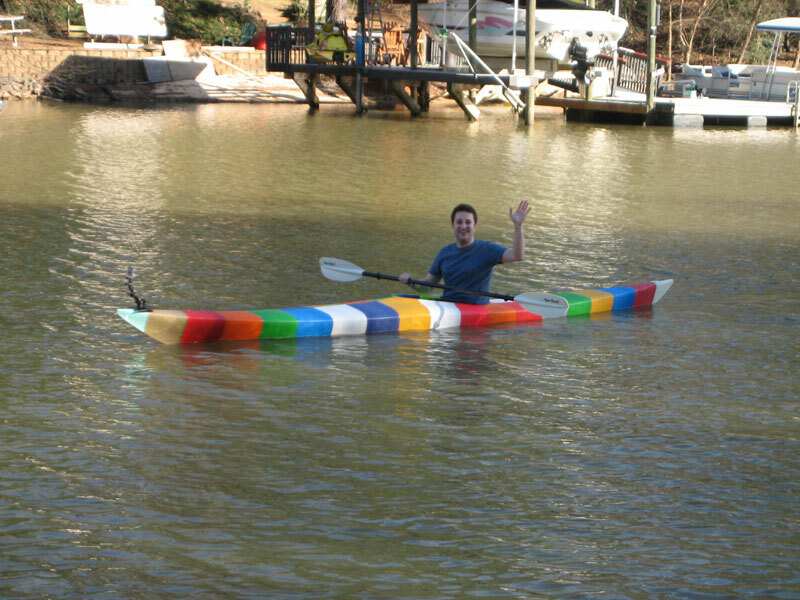 Not only impressive you printed a real Kayak, but I’m in awe you did it with ABS. I just gave up with ABS from delamination an warping. Are you willing to share any additional information on your Heated Chamber? Aside from the reflective material, do you heat the chamber from a heat source other than the heated print bed or Extruder tip? If so, what temperature do you maintain during prints? Do you turn the heat off at the end of the print or have a scale down time/temp to room temp? i.e. ABS curing time? If so, are you willing to share this information? I used the heat from the heated build surface to heat the chamber. Chamber sits nicely in the 65-70C range. After a part finished, I did let the part sit until it reached room temperature before removing. That is amazing! Got to know how well it holds up at the joints to normal use. You have a great concept. Replacement of broken section and not have to start over. Reduce size or change configuration of kayaks depending on need. Very impressive work and a real sign of things to come! From the looks of your heated chamber, it appears that there may be a way to scale up far more and do so efficiently. The company I work for has built many “environmental chambers” for the likes of Lockheed, Boeing, and many others for uses not altogether different from what you might need. Large, energy efficient, and high precision heated chambers are a very reasonable proposition. Please let me know if you would like to get some assistance towards making your ideas even bigger. I can certainly envision building full kayaks, sups, toys, furniture, etc in the very near future — throw away all the molds and increase possibilities exponentially. That is a very long time to print a kayak. Might be better to print an injection or roto mold if economics is to be any part of the equation. I have been working on building a solar powered live-aboard catamaran. I want to build the hulls out of HDPE segments so the 16 meter long hulls can be shipped cheaply and will be very durable. I envisioned exactly what you have done with ribbing structure. 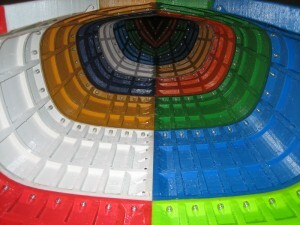 Are you available to work on such a project for printing molds? Great work Jim! I understand it took 42 days to print all 28 parts on one 3D printer. 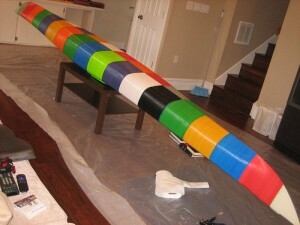 If you’d scale this process, how fast do you think you could build this kayak with e.g. ten 3D printers. Would it be 1/10 of the time? 4 days? If you had 28 printers, you’d be able to print all parts in 1,5 days + time needed for assembly and sealing section joints. 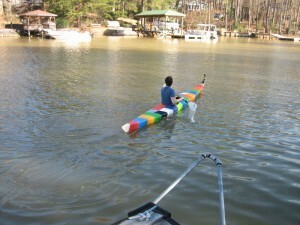 How much do you think you could eventually shorten the construction of one kayak if you had the 3D printers available? Hello Tom, Yes it would scale that way if I had more printers. Probably just take a couple of days. did you have to seal the exterior of the parts? Hello CJ, No I just sealed the interfaces between each section. Your kyak seems to work well on a placid river or lake but would it stand up to the flexing forces to which a sea-going (or white water) kyak would be subject? I suppose there is no reason in principle why a composite hull should not work on rough water/waves (after all, traditional clinker-built boats are made from strips of wood with caulking). Hello Andrew, I do not think a sea kayak would hold up very well in whitewater. really cool accomplishment but curious as to: since every section is ABS, why not glue several peices together as a sub assembly, and only use screws in like two areas, holding together the 3 subassemblies, both simplifying and saving weight, yet still allowing a level of dissassembly? Hello Kenduro, Glue itself would not hold up as well as bolts. Pingback: 世界首款3D印刷獨木舟 | i3D Printer HK LTD.
Do you think of making stl files available for download? Thanks Andrea! They are not available at this time. 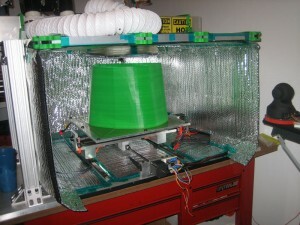 That is a really cool printer setup with the heat chamber and everything! You stated “Each section has brass threaded thermoplastic inserts so the next corresponding section can be screwed into it” so did you put those in as it printed or did you add these during the cooling phase? Thanks Robert, I used a soldering iron to insert the thermoplastic inserts after the part was completed and cooled. Would you consider adding this to Thingverse.com making it open source so anyone can print one out? Really cool. How did chop up the stl file? Can you please contact me re a project. My name is Keejong Jin lives in Korea who is learning 3D printing. I have to prepare graduation work. If possible,I hope to make Kayak to use 3D printing. I would like to ask you if I can get your STL file for Kayak. You do realize if you can adjust for prime fishing kayaks at a cheaper price than what’s offered in the market today you will be in the money big time…don’t you? The kayak fishing market is basically an untapped resource of a huge windfall for you. Do you plan on releasing, or selling the design? I am exploring options for making a ~500 x 300 x 150 mm colourful plastic rounded cover for a structure in the ceiling of in my finished basement. Your 3D printing method seems like the best option so far. Are you open to a business offer? Very nice job done. I would like to repeat it, yet using glassfilled polyprop to make it lighter and cheaper. Would you be willing to share your design files? I’m a serious kayaker, but I don’t have much knowledge in the 3D printer/maker world. I have a few questions. First off, congratulations on the success, I have some criticisms and concerns, but as the first of its kind, it’s an amazing feat! I’m looking forward to eventually seeing later evolutions that are on pace to out-perform traditionally manufactured kayaks! Looks like you’ve got about 6.5 lbs in hardware, it seems like there should be some way to cut weight in this area without sacrificing structural integrity. Are you already using the lightest options such as aluminum screws? Or is that not advisable for other reasons I’m unaware of? Have you made any other efforts to reduce weight? I don’t see foot pegs, rudder system, or bulkheads installed. I’m concerned that after adding these the whole thing would get close to or surpass 70 lbs. I’ll end by reiterating how impressed I am by the project, I don’t believe there’s a any brand new 16’+ kayak on the market. Quite an achievement! Do you know I others have successfully built a 3d printer from your plans? I have several projects I want to print.